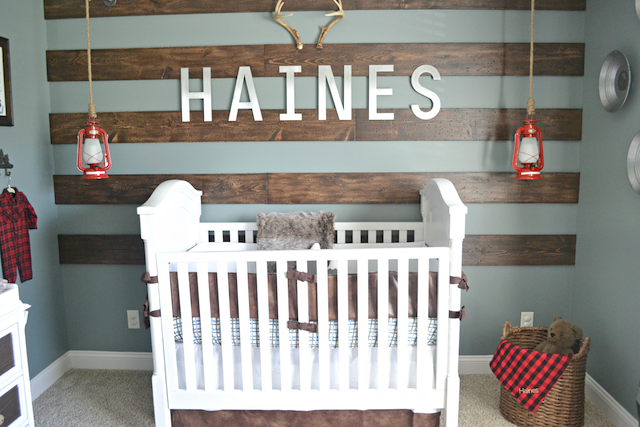 Fawn Over Baby: Guest Post: Eleven & Twelve Month Favorites By Baby Darby & Co. 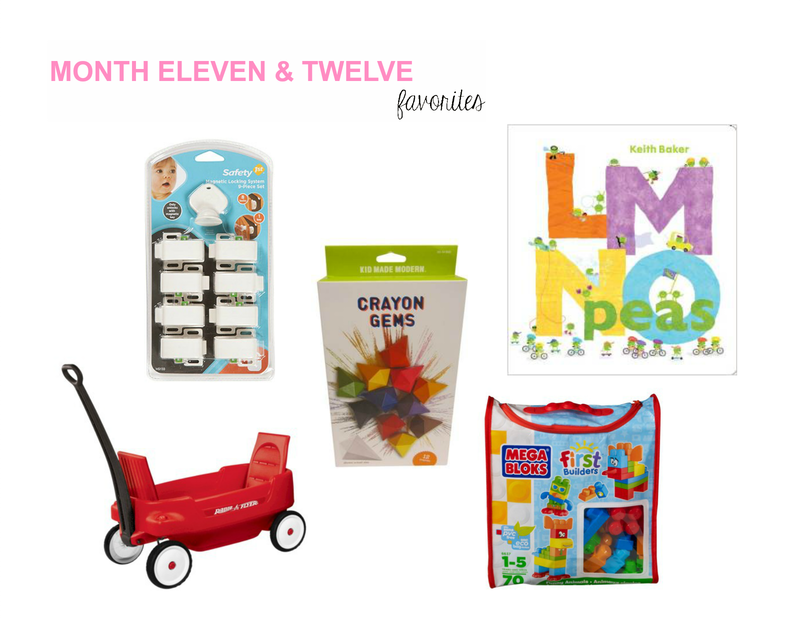 Guest Post: Eleven & Twelve Month Favorites By Baby Darby & Co. Happy Wednesday Fawn Friends! Today I am happy to introduce my newest Fawn Friend and mommy blogger, Patti from Baby Darby & Co. At Baby Darby & Co, you will find Patti sharing her love of family and her passion for photography and DIY projects. 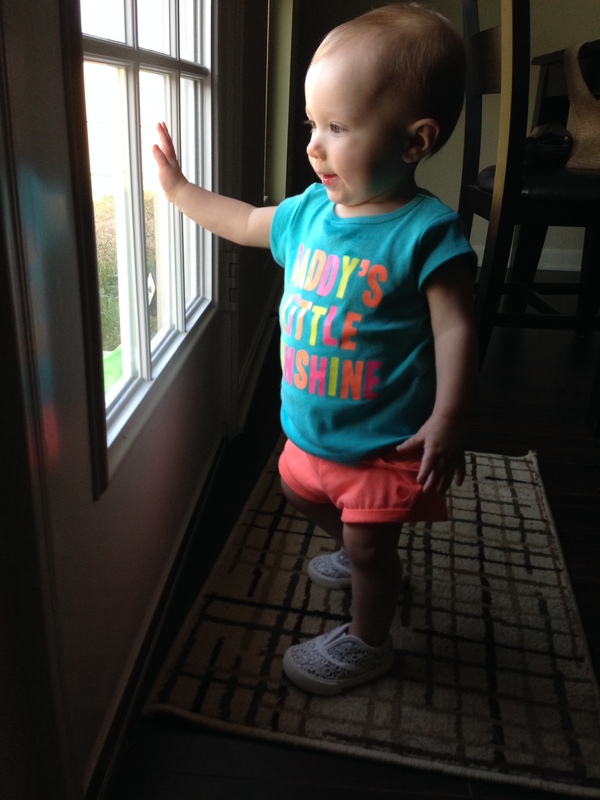 Le'ts give Patti a warm welcome as she shares her newly one year old, Allison's 12 Month stats and favorites! Feel free to stop by Baby Darby & Co. to say hi and follow along via Twitter, Pinterest, Instagram, & Bloglovin! Safety 1st Magnetic Locks: My oh my how wonderful these locks are! Seriously. No more partially opening cabinet doors and smooshed baby fingers! They were a little bit pricey but WELL worth it in my opinion. The only downside is if you lose the key, your out of luck. Wagon: Allison is a firm believer in taking as many walks/rides outside as humanly possible, rain or shine. Santa brought her the wagon for Christmas but it wasn't until recently that we've had a chance to really put it to use. She loves to stroll through the neighbor hood in her onesie and sunglasses (the girl's got style) or through the house. I'll have to tell Santa thanks the next time I see him...I guess I got a built in workout plan for Christmas. Crayon Gems: I've looked and looked all over for these online and in the store but I think they have been discontinued. Anyways...the Easter bunny brought these for Allison and they are the coolest crayons! They are super kid friendly to hold and actually use (not much pressure needed to make a mark). Mega Bloks: Best. Present. Ever. I labored over what to get her for her first birthday and settled on these thinking maybe she'll play with them. I She LOVES them! They are always scattered about the floor and occasionally end up being stepped on or stashed away by the dog. Fun for all! LMNOpeas: Allison loves books in general, but this book is super cute! 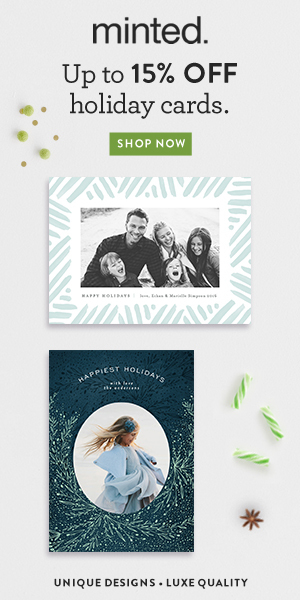 Adorable pictures and pretty colors. Perfect combo for a baby bookworm! Clothes: A few 9 month outfits but mostly 12 months. She has filled out so much in the past two months. Favorite Foods: Cheese, Crackers, granola bars, mac-n-cheese (can you tell we feed her such healthy foods), & yogurt (this kid LOVES yogurt!). Favorite Words: Momma and Dadda. Favorite Toys: Books are still by far her favorite toys. But she also is a sucker for an iPhone, remote control, or the cats fur. Ya know, the important stuff. Favorite Activities: She loves being outside and going for walks, reading books, getting into the cats water bowl, & she also has figured out how to open cabinets. Least Favorite Activities: I'm pretty sure this is going to stay the same forever. She absolutely HATES having to lay down to change her diaper, clothes, be put in her car seat, or anything that requires her to sit still. She is becoming more and more adamant with her protesting. It's getting a little ridiculous. Proudest Moment: I took her to work with me the other day for a little while and she just could and would not stop giving me hugs and kisses. Times like those make me forget all the bad/sleepless nights and remember why I wanted to become a mom so badly. Other Milestones: She has cut two of her back molars, the other two are on their way in...this kid has 10... yes you read that right...TEN teeth. What, the what?! She is becoming more independent and so much more interactive with Charles and I. We also completely cut out bottles this past month...only sippy cups for this little toddler! :( I actually cried. Here are pictures from her first birthday party!! Where did my baby go? For all of you brand new moms, moms-to-be or even vet mom, these are the best times of your life, enjoy every little moment because before you know it they'll be a year old and you'll look back and try and figure out when it happened. Don't wish them onto the next milestone, I know it's hard, I've been there but looking back I wish I would have taken more time to appreciate her learning and growth. she is just absolutely adorable!